Elbow pain is a frequent reason why people consult me in acupuncture. Acupuncture is very effective in calming the pain and helping to get back to a normal life. Whether the elbow pain happened because of too much shoveling, working excessively with vibrating machinery, working too long at the computer, or playing the guitar, the result is most often the same. When we do the same movements repeatedly or when we force the muscles in an inappropriate way, small injuries appear in the tendons. These micro-traumas create less elasticity in the tendons because the collagen produced to repair the tendons is not as good as the quality of the original tendon. There are two forms of elbow pain (epicondylitis) which are more commonly known as tennis elbow and golf elbow. Tennis elbow affects the external side of the elbow, while golf elbow affects the internal side of the elbow. 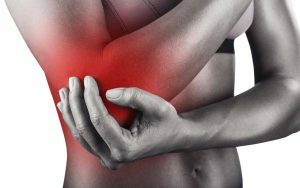 In this article, I will be concentrating on tennis elbow, which is the more common form of elbow pain. 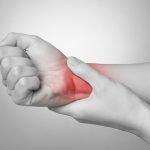 Although the pain is located near the elbow, it is usually caused by using the wrist repeatedly or more intensely than normal. This is because the muscles which insert at the elbow go down through the forearm and insert near the wrist or hand. These muscles allow the wrist to bend upwards and straighten the fingers. 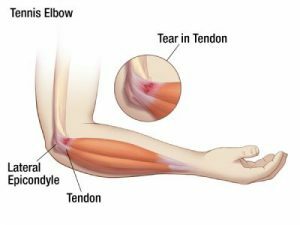 When a muscle gets inflamed or irritated from repetitive movements, the muscles shorten and pull on the tendons, possibly creating small tears in the tendon, and referring the pain around the elbow. Elbow pain can persist for a few weeks, or even a few months if it is not properly treated. The pain from tennis elbow often radiates from the elbow to the forearm and can intensify when grabbing an object or shaking a person’s hand. At work or while doing renovations, it is important to be aware of your body and to use your muscles properly, while also allowing your body time to recuperate. Be careful with any movements of the hand or wrist that requires a lot of force. When operating hand tools, especially ones that vibrate, make sure that you are not using your wrist inappropriately or with too much intensity. If you work at the computer for long periods of time, make sure that your work station is ergonomic. A good piece of advice for anyone who works physically is to try and do different tasks instead of the same one for a long period of time and to take breaks to stretch from time to time. Acupuncture is very effective in calming elbow pain. It helps the body to heal itself better and faster and can lessen any inflammation that might be present in the muscles. An acupuncturist can also give advice on proper stretches and strengthening techniques to do in order to not only help the elbow pain heal, but more importantly, prevent it from coming back.